Twenty-four teams participated in Midlands Striper Club's January tournament on the 18th out of Acapulco Landing, and the teams combined to bring 52 rockfish to the weigh-in. Nine teams came in with a four-fish limit, despite some bad weather conditions. Team Gar-Heart, with anglers Shawn Gearheart, Daniel Sullivan, and Matt Halverstadt, won the tournament with four fish weighing 33.88 lbs, including the Nichols Store Big Fish that tipped the scales at 20.07 lbs. Team Rocky Bottom took 2nd place, with Townsend Wessinger, Bill Linse, and Baylon Moore putting 30.30 lbs in the boat, followed by the 3rd place team of Team Catch 22, who weighed in 28.54 lbs. 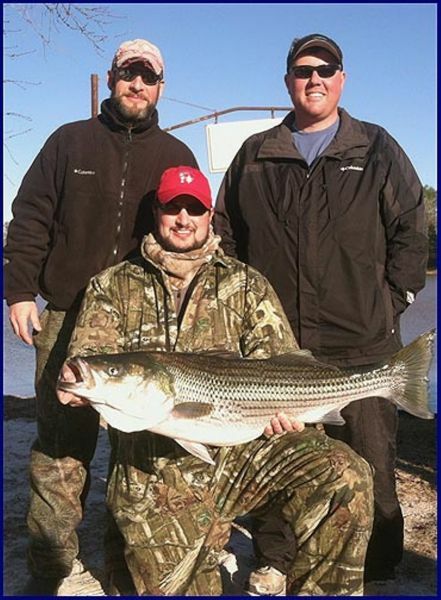 For more information on Midlands Striper Club and to see their tournament schedule, visit www.midlandsstriperclub.org.